Hello there, so happy coming again this time to bring a valuable post that most people don’t really care about but very import. “How to invite admins” to your blogger blog. At one point in time you might want to extend your rate of publishing and you realize you can’t do it alone, probably because of tight schedule. 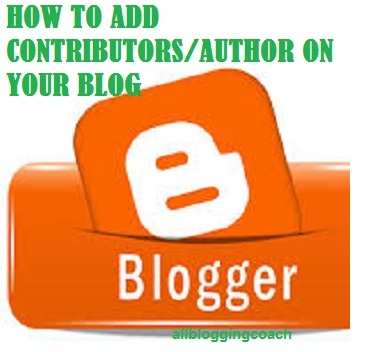 Owing to adding authors/admins to contribute to your blog. You’re are also getting skeptical of your private materials on the post but you only want to restrain them to just posting and replying to comments. Before this post, I remember a reader seek for help that I should help her activate her AdSense code on mobile view, but she was very reluctant to making me a contributor on her blog, so she a send me her login details which I tell her it’s very wrong. If you send your blog login details to the wrong person, it might cost you the whole of your blog. Therefore, to help those who don’t know how to invite others to contribute on their blogs, then you need to adhere strictly to the two-step process I explained below. 1. You can add someone to only contribute to your blog by posting contents and nothing more. 2. You can add someone to have the admin privilege i.e. have the same access you have as the owner. • Beneath permissions, click on +Add authors, enter the email address of the contributor(s) in the space provided and finally click on invite authors. >>>An open box will come up where you will put the email of the contributor you are about to invite. Conclusively, i believed you’ve learnt one or two things from this post and also the issue of adding contributor has been sorted. However, i still believe there are people out there who couldn’t reach their hands to this post, but with you, you can share out this post to your friends on social media. It has been almost a decade when I had last posted on a free hosted blogger blog – some of the screenshots that you have posted bring back memory. Though I believe these features weren't available at that time. Thanks uttoran Sen for taking your time to read the post, a lot has been happening on blogger which makes it more interesting than before. Like the one you said about posting under one's name, there is code for it as well. Wonderful and details post dude, I guess you've stopped updating articles.. I'd recommend you to post more informative posts. Thanks for your love and observation, actually have been busy with some stuffs for readers on allbloggingcoach. So we are back now.